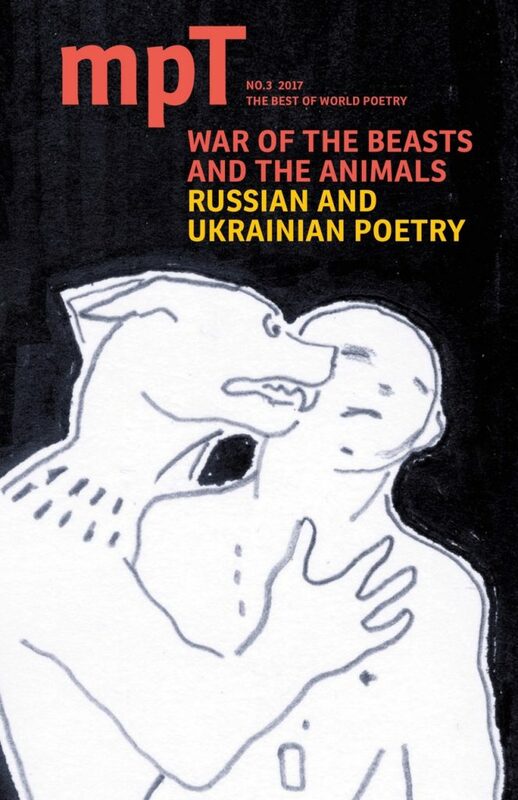 MPT’s autumn issue ‘War of the Beasts and the Animals’ focuses on Ukrainian and Russian poetry, with a selection of new translations of Ukrainian poets writing about the war in the Donbas, including the acclaimed war poet Serhiy Zhadan as well as Oksana Lutsyshyna, Boris Khersonsky and Vasyl Makhno. This work is published in collaboration with a new US anthology Words for War: New Poems from Ukraine (Boston: Academic Studies Press, 2017). Alongside the Ukrainian poetry we’ve placed Russian poetry of protest, including the epic poem ‘War of the Beasts and the Animals’ by poet and activist Maria Stepanova, published for the first time in English. The magazine also features poetry by Yannis Ritsos in David Harsent’s translation; new translations of Friedrich Hölderlin by David Constantine; a selection of text ‘modules’ by Polish poet Bronka Nowicka, winner of the NIKE Prize; and poems by the French contemporary poet Ariane Dreyfus in specially commissioned translations by poets Olivia McCannon and Susan Wicks. All in this new issue of the groundbreaking magazine dedicated to poetry in translation: for the best in world poetry read MPT. Tanzanian poet Euphrase Kezilahabi in an new Selected.